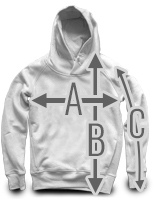 This hoody offers you a print/3D-embroidery combination on the front. In addition, it has a 3D embroidery logo on the sleeve. Extra thick cords, a reinforced hood, as well as embossed eyeletts are of course also included. The patented Sourkrauts mobile phone bag is of course also on that hoody.